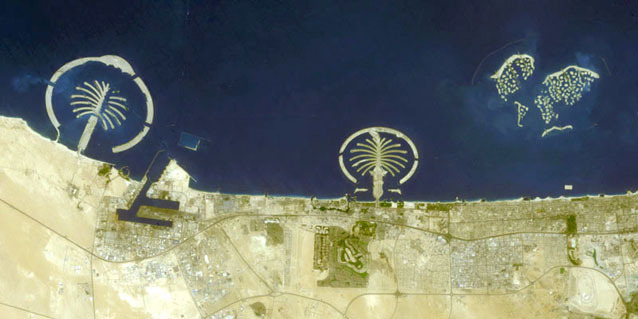 The coastal strip of Dubai has seen dramatic development in recent years, as shown by this satellite image taken in 2006. Three artificial islands are nearing completion in the shallow waters of the Arabian Gulf as part of an ambitious land reclamation project which will add 520km of new beachfront to the city's shoreline. We have used Landsat data to generate an updated shoreline map of the UAE coast for the Abu Dhabi government.